Give the 2018 Jeep Grand Cherokee a closer look and you will see why so many drivers think this is the top SUV on the market today. 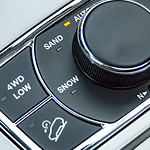 These exterior features help keep the driver safer behind the wheel. The LED taillamps on the back of the Grand Cherokee serve double-duty, keeping you safe and keeping motorists out of trouble on the roads. These lights are brighter than normal tail light bulbs. This means other drivers will be more likely to avoid your vehicle because they have more time to bring their car to a stop. The Automatic High-Beam Headlamps equipped in the new Grand Cherokee open up the road at night so you can see clearly. The high beams stay on until other cars are detected, then they dim until clear and go back to high beams. Get behind the wheel of the Jeep Grand Cherokee for a test drive when you stop over at Ross Motor Company.